Part 1 of this post describes how we got from engagement to deciding to have two weddings (one American and one Indian) over labor day weekend in central Massachusetts. Now, let’s talk about the specific layout of the weekend. 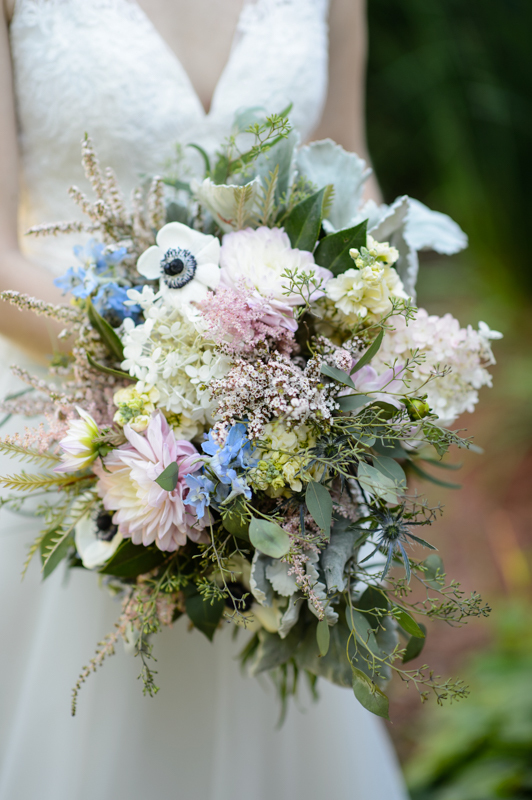 I had a dream that my Husband and I would work seamlessly together, creating a wedding that was a true blending of our taste. But I was a bit naive. Not only are we both stubborn and opinionated, but we both have extremely different tastes. It took a few fights and mistakes before I just caved to his request to create the wedding of my dreams. My fear was that he wouldn’t feel emotionally attached to the American Wedding if it was only my dream come to life, not his or ours. And that fear came from a real place, but I just had to embrace that perhaps he didn’t have as many visions of his wedding as I did and that the napkin color didn’t affect him the way it affected me. Eventually, it was his mother who told me the wedding was about the bride and to forget the groom. 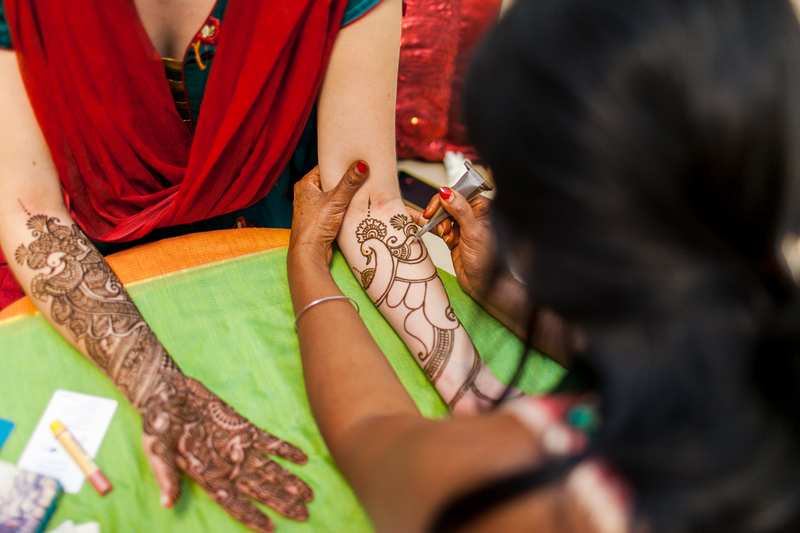 Completely equal, custom-blended weddings seem to be a more modern concept. 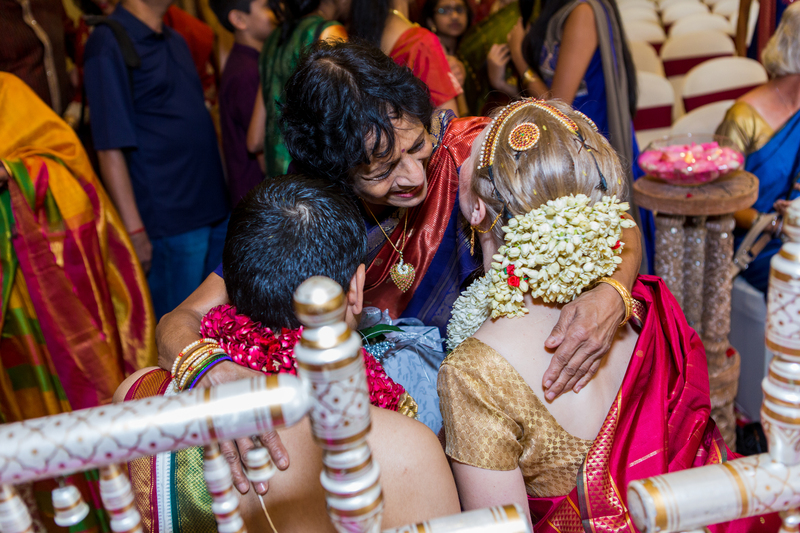 I still struggled, until I admitted to myself that my greatest fear was that the Indian Wedding might mean more to him in the long run than the American one. I wanted to share our most precious moment, not each having our own. I decided to accept that my fears may be well-founded, but that is the situation I chose. If I wanted someone whose desires and traditions completely align with mine, I would have had to marry someone completely different. I love my Husband and the excitement our differences bring. So I sucked it up and took control of the American wedding. In the end, the guests appreciated the two clear visions of two diverse people, rather than one perfectly in-sync event. I can’t speak for my In-Laws, but I believe this decision boiled down to two things. Will they let us use an outside Indian caterer? Surprisingly few venues can handle more that 250 guests. And there are even fewer that don’t require you to use their services or a short list of caterers for food. 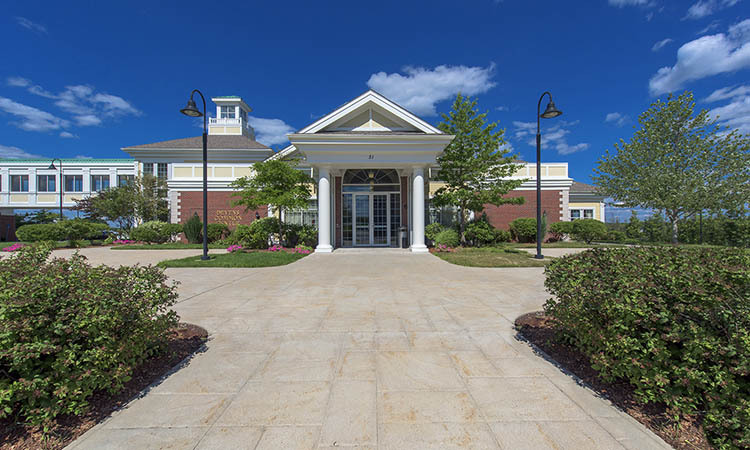 After searching in vain in Worcester, MA, they narrowed it to the Devens Common Center, which is reasonably priced, familiar with Indian weddings and sandwiched by two hotels. 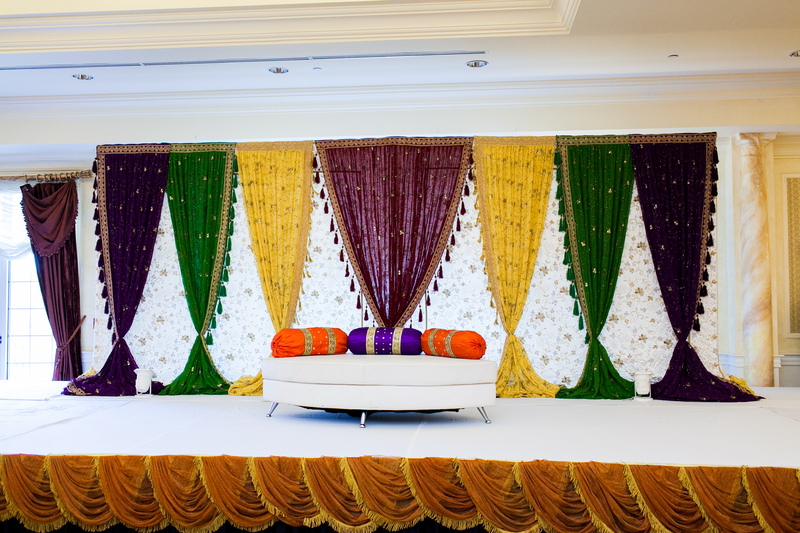 As a side note, Boston has many venues of the right size with experience in Indian Weddings. 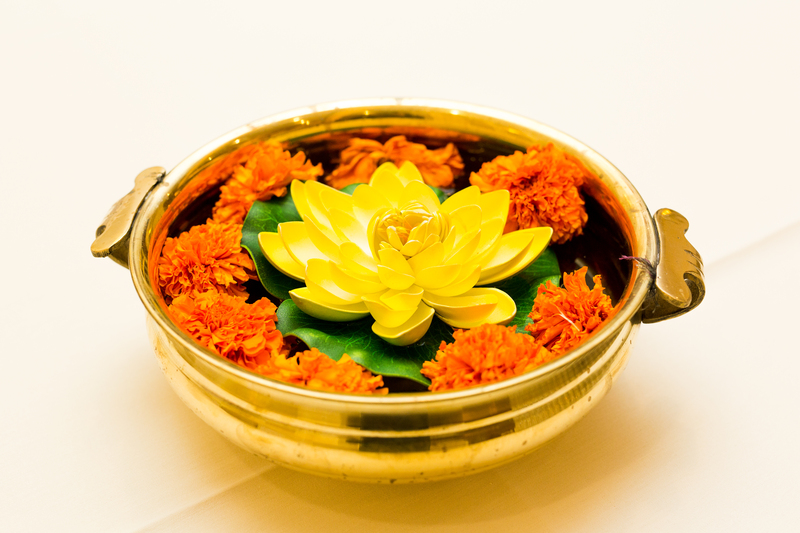 While most do not allow outside caterers, there are a surprising number of hotels with complete Indian menus just for this purpose. Warning – you’ll pay for it! Saturday was already set for the American Wedding. We’d let it play out like the average Christian wedding in 2015 – bride prep, ceremony, cocktail hour/photos and reception. My photographer was a great help in nailing down the exact times. The bridal party got our hair and make-up done at my childhood home, and we headed over to the venue a bit early for bridal party photos. My Husband wanted the impact of seeing me for the first time as I walked down the aisle, so two photographers coordinated to prevent the groom and I from crossing paths. The ceremony was beautiful. As we left, we were surprised by an Acapella group from our Alma Mater, all set up by my incredible sister and brother-in-law. After about 45 minutes of photos, we spent a brief time chatting with guests before being introduced. A choreographed first dance, a blessing from my grandfather and the father/daughter dance all followed. We danced like crazy until 10:30pm and left the mansion with a sparkler exit. We tried to have an after party at the grill across from the hotels, but they closed promptly at 1am. Noone was too disappointed; there were another 2 days to go! A day of rest for the guests and the groom… and a day of sitting still for me. Meanwhile, the wedding guests had the freedom to do whatever they wished in the area. About a month before the wedding, I sent out a travel guide I created to all the guests. 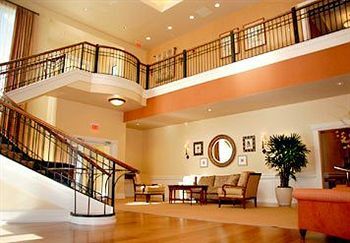 It included restaurants, attractions, wineries, golf courses, etc. A few of my friend groups merged after meeting the night before and sent me some jealousy-inducing photos of them lounging and playing board games as I sat getting my mehndi done. After scraping off my mehndi, I was plopped into a chair for hair and make-up and sent out to do couples pictures with my Husband around 5:30pm. Wikipedia Definition: Baraat (Hindi: बरात) (Urdu: برات‎) is a bridegroom’s wedding procession in North India and Pakistan. In North Indian communities, it is customary for the bridegroom to travel to the wedding venue (often the bride’s house) on a mare, accompanied by his family members. Firstly, we did look into it, and it costs $7,500 a day to rent an elephant. Luckily for my hubby, it was elephant or nothing… so he walked/danced to the venue. The bride and grooms side separated at different hotel lobbies, so we could each parade to the venue. These parades are called the baarat. In most movies, the groom comes to the wedding on a horse or elephant. 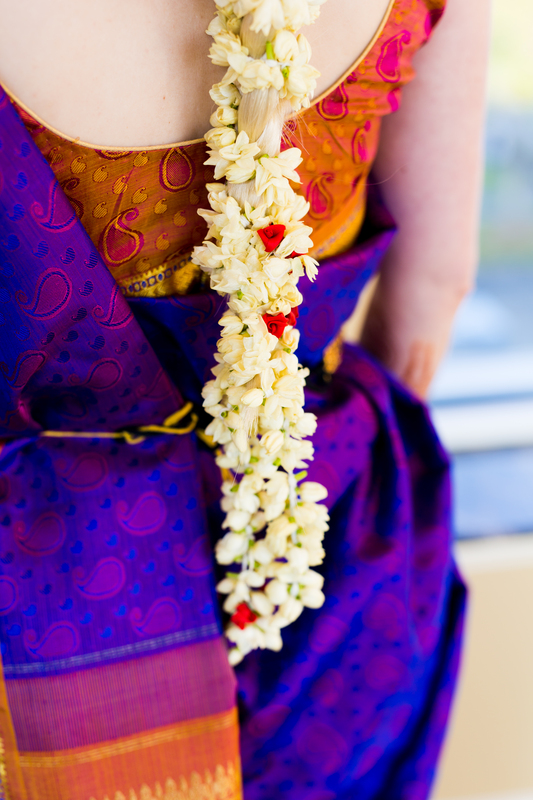 Tamil weddings don’t usually include them, and in the North, this happens before the ceremony. But what the hell – my Husband had always wanted a baarat like the Bollywood movies, and the ceremony was too early the next day. So before the sangheet it would have to be. 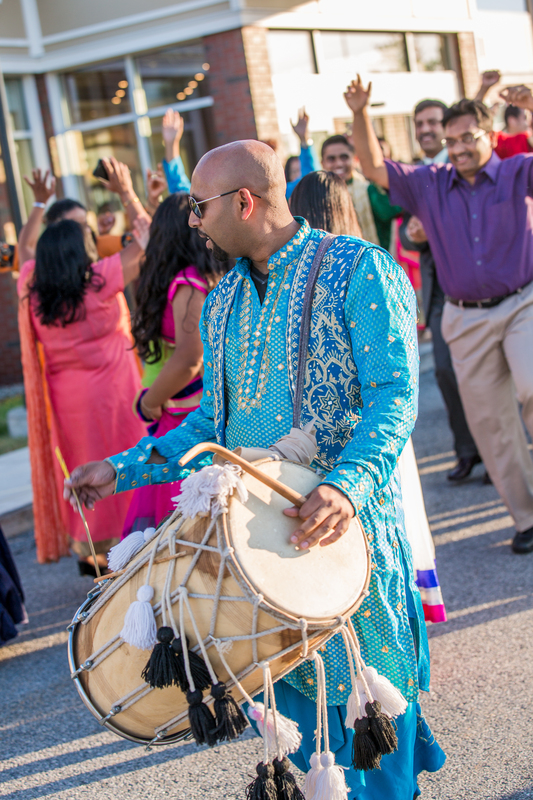 Wedding Tip: Get a live dholi! A dholi is a drummer who will lead the parade. Ours helped my side loosen up by teaching them the classic lightblub twist and coaching them in yelling “Hey!” It made all the difference in helping my New England family feel comfortable in letting loose. The Bride’s parents and relatives meet the Groom at the door of the venue to give him their blessings. I have to say the photos of my Dad and Husband hugging leave me misty-eyed. 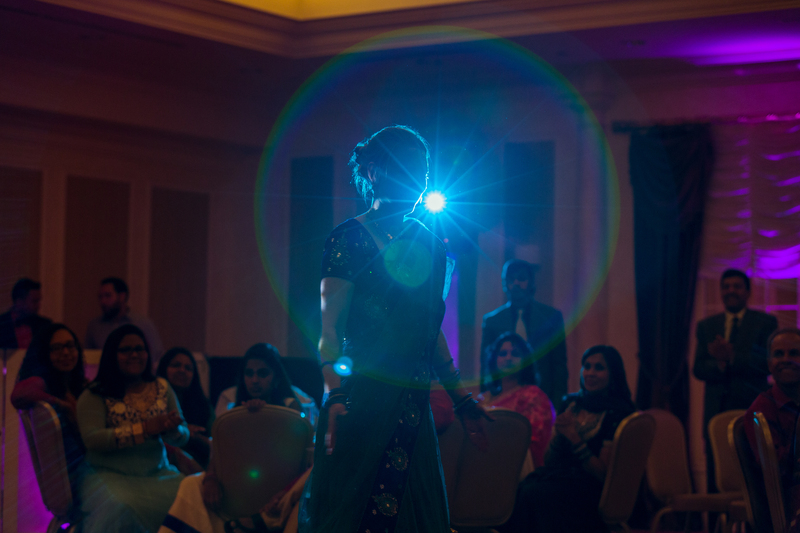 Sangeet – Another Northern tradition we borrowed for the fun of it is the Sangeet. Once is was a kind of bachelorette for the bride’s side, now it is often just a large party for both sides to get to know each other better. If there’s any American equivalent, it would be an American wedding reception. The Bride’s Entrance involved my uncles holding a red canopy over me as my friends and family entered the hall to may favorite Bollywood songs and a little Taylor Swift. The Groom’s Entrance would normally go next, but we both felt there was enough arriving and entering already. So we scrapped it to get the appetizers out and the drinks flowing. This may feel like an unusual start to the American Bride – dancing first – but I think it’s something all weddings should adopt. Get the energy up immediately and get people comfortable with throwing their arms up, all before the first bite. Towards 11pm, the DJ transitioned from fun dance night to wild party. By 12pm, I was barely standing and dragged myself to bed. I think they wrapped up around 1am. 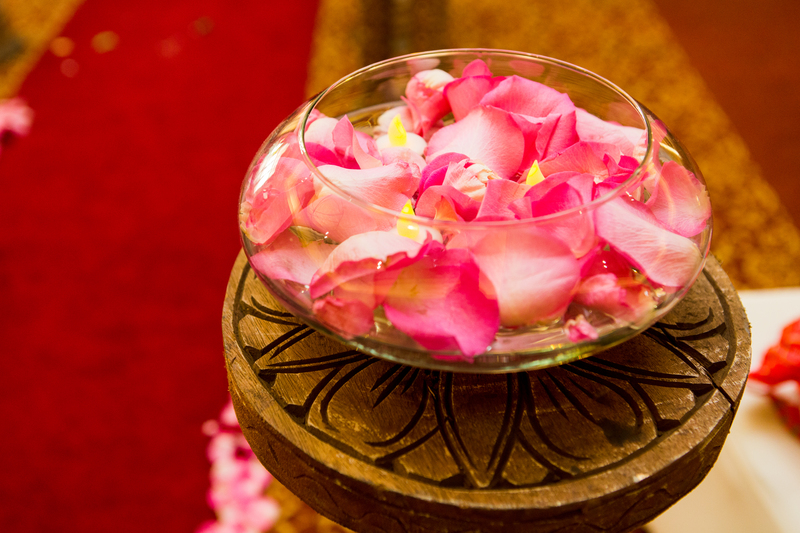 4am – My poor husband had to wake up at 4am to start a series of family specfic rituals that needed to be complete before the wedding ceremony could start. 6am – My wake up time. Notice no breakfast… while the guests could eat their complimentary breakfast at the hotel. My In-law’s religious practices called for fasting before the ceremony. I’ll go over these in another post, but they are shorter ceremonies that need to happen to start the main ceremony at the auspicious time chosen by the priest. This includes: Kanyadanam, Mangalya Dharanam, Paani Grahanam, Saptha Padhi, Pradhaana Homam, and Treading the Grindstone. The timing is based on the Hindu religious calendar. Make sure to remind guests that you’re not expected to sit quietly through this ceremony! 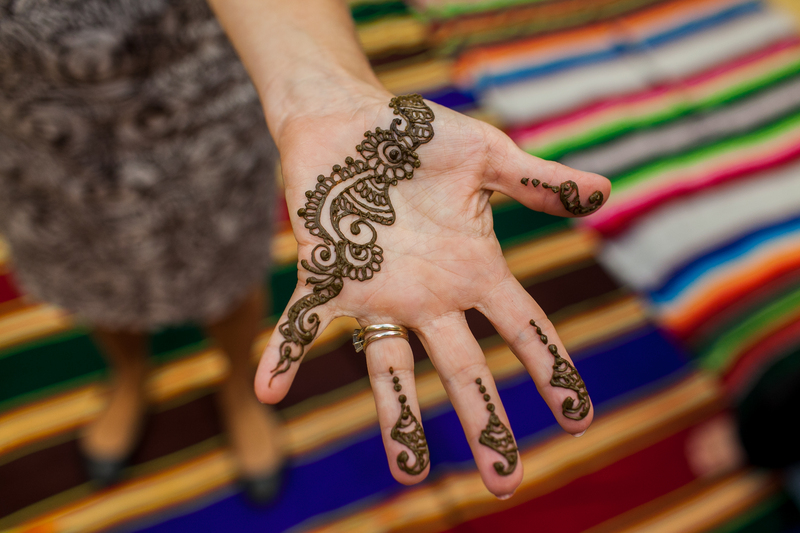 Indians will be mingling, eating and chatting so the American guests should too! Since this ceremony will be in sanskrit, I suggest either a written explanation of what is going on or have the DJ explain over a mic. We did both. You’re going to be tired, and you’re going to hungry, but you’ve got a few hundred people that traveled from afar to share this day with you and show their love. You’ll take pitcures and accept gifts, but most importantly, you’ll perform Napka. Napka (forgive me if this is a horrible translation) is when you bow before your elders, so that they can give you their blessings. The bride stands to the groom’s right and bows to the ground as they throw rice on you. Honestly, this was really fun for my family! Self-explanatory. I still get compliments on the food months later. 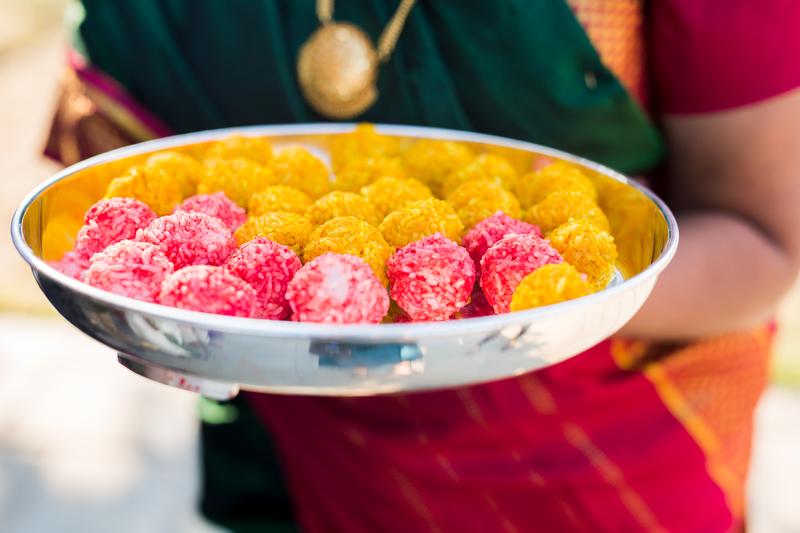 Specifics on vendors, details on the Indian traditions and tidbits on what I learned will roll out in future posts. The next batch will be about my first family trip to India. Talk about out of your element! Quick shout out to this helpful page (http://www.hinduwedding.info/faqs.html) which mostly reflects my experience. Remember North and South Indian ceremonies are different! And don’t forget to shake it up! Even though there are lots of traditions, stick to the ones that really matter to both your families. As long as everyone has fun (and you actually get married), it’s a success!